Fury? For PvP? Oh yes. 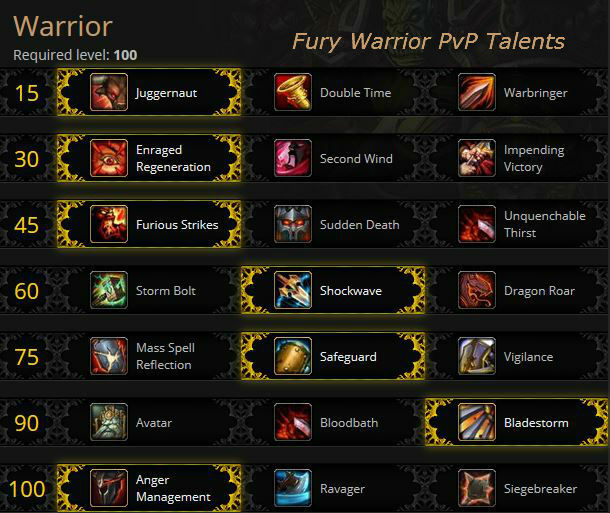 Fury in Warlords is doing very well for PvP. Fury does plenty of damage, you might even call it the “Whirling Blades of Doom!” spec. If Fury’s your game then read on and destroy those who think it’s not so hot. Also remember that dual wielding greatswords adds just that much to your PvP awesomeness. In Mists of Pandaria, with the complete revision of the talent system, Fury became more viable than before as a PvP spec. in Warlords, with all the ability changes, it’s the Flavor of the Month and Arms has fallen behind. This page assume that your Warrior is at level 100. If you’re not there yet then use what you can. If you need to get to 100 ASAP then take a look at Zygor. The talents shown are for general use, but sometimes you will want to change them for specific situations. Keep a stack of Tome of the Clear Mind for just those situations. 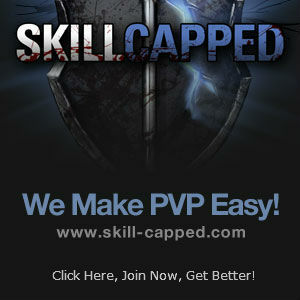 Visit Skill Capped for all kinds of guides on those specific situations and many other things. Descriptions are below the image. Our picks are checked . Level 15 Talents: Charge it! All three talents on this tier are useful and your choice should be based on your game. Note that your 2-piece set bonus adds a crit large bonus to your next Bloodthirst, almost guaranteeing that you’ll soon be enraged. Low CD: Juggernaut is best used for when you need to charge on a semi-frequent basis. The short cooldown is rather nice and matches well with the “get away” abilities of Mages and Hunters and such. Stun: Warbringer is for adding a stun to your charge. If that’s more useful that double tapping charges (and many think it is,) then grab this one. Especially nice when fighting Resto Druids and the like, as it helps to train them. Heal: Enraged Regeneration is a great on demand survivability mechanic, especially if you don’t want to add another strike to your rotation. Usable while stunned. Leech: Second Wind is best used when you anticipated being low on health quite often during an encounter. Pretty weak for PvP. Strike: Impending Victory is perhaps the most useful of the three as it can be used on demand and more frequently than Enraged Regeneration for a very low rage cost. If you have room in your rotation you can use it as a filler attack. Level 45: Make some noise. All of these have their uses. More Wild Strikes: Furious Strikes for cheaper Wild Strikes. That’s a lot more Wild Strikes. Will result in a lot less downtime in your rotation. About the same DPS overall as Sudden Death. Nice to have a strike that’s somewhat spammable and that isn’t as random as Sudden Death. More Executes: Sudden Death gives your autoattacks a chance to proc free Executes, which can also be used on the enemy regardless of its health level. If you’re using two one-handed weapons you will get more procs, but they won’t hit quite as hard. Much more “RNG” than the others, so you can’t count on the proc. Scales better with gear than Furious Strikes. More Bloodthirsts: Unquenchable Thirst removes the Bloodthirst cooldown. More Bloodthirsts = more enrages and more procs. In execute range more Bloodthirsts = more rage = more Executes. Your pick will also depend on what your team can do and how many stuns they already have. Ranged stun: Stormbolt stuns the enemy and does a small amount of damage. Nice ranged stun on a fairly short CD. Fighting Casters/Hunters? Then this is the only pick. Cone stun: Shockwave does a bit of damage and is nice for melee range groups. When you hit 3+ of ’em you get a cooldown reduction. Nice when peeling melee off your healer or other team member. Area damage: Dragon Roar is light on damage, it not a stun, and all the damage is split among all opponents. The other two are generally better. These all have their uses. None have any use in duels. Reflect: Mass Spell Reflection is useful in the battlegrounds. especially against casters (obviously.) Also reflects Hunter traps, which might be very useful. Short (30 sec) cooldown. Intervene: Safeguard is useful as damage reduction and getting yourself into the face of the guy(s) attacking your healer/ally. You charge the targeted ally and they take 20% less damage over 6 seconds. Oh yes, you also eat the damage of the attack. Very nice gap closer if melee is in the face of your buddy. Much shorter cooldown than Vigilance. Protect: Vigilance is similar to Safeguard in that it provides damage reduction to your buddy, but you are not moving to their position nor eating that big attack. Target damage is reduced by 30% for 12 seconds. Longer cooldown than Safeguard. Nice when opponents are blowing a longer/heavier cooldown, such as Berserk, trying to burst down your ally. Vigilance also does not take out out of position, and Safeguard does. All of these have their uses, depending on your opposition and what you like to do. Raahhhrrrr! : Avatar – Become mighty, and immune to CC, for 20 seconds. Nice burst CD. Blood: Bloodbath bleeds and slows your opponent(s.) It works with all your strikes and their Multistrikes. Lines up nicely with your “on use” trinket. That slow, which is applied with every strike, is very nice when training people with spammable escapes (such as Ferals or Rogues with Burst of Speed.) The bleeds will break other CCs, such as your Fear. CC break: Bladestorm is beneficial during situations where you wish to avoid losing control of your character and/or are fighting several players. You can’t be CCed, so call this a mobility talent, in addition to damage. Also, Bladestorm does damage very well even though you can’t do anything else while it’s up. Heroic leap into a group, Shockwave, and Bladestorm. Cooldowns: Anger Management reduces the cooldown of a number of abilities, depending on how much rage you spend. A nice passive that you don’t have to think about. The more time you can spend in your opponent’s face (meaning you’re spending more Rage) the better it works. If you’re chasing things all the time then not so hot. Area damage: Ravager breaks CCs in the area and depends on your opponents staying in place for a bit. They sometimes do this – fighting around a flag or control point, for example. Strike: Siegebreaker replaces your Intimidating shout with a melee range strike and only affects one target, but hits that target hard and knocks him back and down. That knockdown will interrupt casting. Not worth losing your Fear, generally, but has some value in certain situations. One of the interesting Warlords glyph changes is automatically learning some as you level. Just like you do with abilities you’ll learn a few glyphs. You still have to install them, as before. The rest can still be bought from friendly (or greedy) scribes and off the Auction House, as always. Exclusive glyphs are those sets of glyphs that cannot be used with each other. You can only use one from the set. As an example: Glyph of Wind and Thunder and Glyph of Raging Wind are exclusive. The glyph tooltip will tell you which glyphs are exclusive with other glyphs. The first two are pretty important, but you canonly use one at a time. The rest are situational. Pick them according to your game and the opposition. More Rage: Glyph of Bull Rush lets you get more rage from your charge, which is always useful. It’s exclusive with Glyph of Blitz. Hit three: Glyph of Blitz – your Charge roots an additional two targets (or stuns them if you’re using the Warbringer talent. ) Exclusive with Bull Rush. Defense: Glyph of Flawless Defense – Do you use Die by the Sword often? This reduces the chance for you to be crit while that is active. Faster: Glyph of Enraged Speed lets you move faster while enraged. Stacks with the +10% speed cloak enchant. More damage: Glyph of Rude Interruption lets you do more damage after pummeling. If you’re regularly interrupting people then this is a very good glyph to take. Heal: Glyph of Bloodthirst because you need all the healing you can get. It doubles the Bloodthirst heal. More Rage: Glyph of Unending Rage is a pretty much required glyph as it adds 20 rage to your pool. More leaps: Glyph of Death From Above for more damage (due to lower cooldown,) but only jump 25 yards. Area: Glyph of Wind and Thunder for a bigger Whirlwind radius, which is nice against larger or more spread out groups. 15 sec Reck: Glyph of Recklessness makes your Recklessness less effective, but longer lasting. Maybe useful if you want to outlast someone’s defensive cooldown. Move Faster? Glyph of Heroic Leap – faster movement after leaping. Getting Kills? Glyph of the Executor – nice way to keep the Rage high when getting kills. More Health? Glyph of Rallying Cry lets you heal for 20% of the damage you cause while Rallying Cry is active. Use this when you blow you damage cooldowns for a decent amount of healing. Bubbles? Glyph of Shattering Throw – only useful if fighting people with invulnerabilities, such as the Paladin’s bubble. Hunters/Casters? Glyph of Long Charge for when you can use that extra range. Glyph of Intimidating Shout – your Fear target(s) stays in place instead of running.Nice if you want to trap/urn then all. Glyph of Burning Anger for those times when you’re just burning mad. It’s also another way of seeing when your enrage falls off. Glyph of the Blazing Trail works well with the above glyph. Leave a burning trail when you charge. In Warlords Hit, Expertise, PvP Power, Resilience, and Reforging are all dead. You have Multistrike and Versatility and your new stats. Those Bloodthirst crits (or activating Berserker rage) will Enrage you. Cruelty, your “attuned” stat adds 5% to your Crit rating from all sources that add Crit. Look for Crit & Mastery on all your gear. The Crit helps to get you Enraged and the Mastery improves the damage you do while enraged. They work very well together. It’s not the Crit damage you’re really interested in, though that’s certainly nice, it’s the procs you get: enraged and Raging Blow. There is a Crit cap – You have a base of 10%, another 30% from Recklessness (with its perk, 15 without,) and 30% from Bloodthirst, plus any other buffs you might have from your team, chemicals, etc. Any Crit over 100% is wasted. So your Bloodthirst crit soft cap is 30% (100% crit chance for Bloodthirst with Recklessness up) without team or chemical buffs. It’s 60% (good luck hitting that) without Recklessness. That first 30% is the most important, it’s a bit less important after that. After that 30% (before other buffs) your Mastery becomes more important. Your goal, ultimately, is to stay enraged all the time and to hit as hard as possible while enraged. Mastery increases your damage while enraged, so the two work very well together. Versatility increases all damage and healing done by you and, at half value, increases your damage reduction. Haste is a much better stat than it used to be, due to your new Headlong Rush ability. Any Haste you have will work to reduce your Global Cooldown and your Bloodthirst cooldown. Still, the others are better. In 6.2 gem slots occasionally appear on random PvP gear, not the stuff you buy from the vendor. Gem for Crit until “capped” and then Mastery. Gem sockets have a (small) random chance to appear on gear. There are no meta gems or sockets, there are no socket bonuses, and all sockets are “prismatic,” which means that they will take any available gem. Older (Mists of Pandaria) gems work until item level 600, but the item squish of Warlords cut them down a bit. What used to be 160 Int is now 10, for example. The new Prismatic gems are 50 points of Mastery or whatever. Older gems (Mists of Pandaria and lower) that used to code for Hit now do Crit, gems that had Expertise are now Haste. If you can’t afford the gems then see our gold guide. There are “perfect” gem cuts, for the older gems, that have the same stats as the “regular” gems. One of the other (depends on your server) is likely to be available for a much lower cost. They are listed in the table, below. 35 point gems are cheap, 50 pointers are not, and 75 pt gems are grim. Dropping down one level, or two, will not kill your PvP chances. Enchant Weapon – Mark of the Shattered Hand – sometimes bleeds your enemy over 6 seconds. Note: There is a “breath of” version of each of these enchants which have the same stats, without the 10% movement bonus, and which is much cheaper. If you have the heirlooms then don’t worry about gear until they hit their level cap. If you’re just leveling to get to 100 then don’t worry too much about gear. If you do enough BGs you can collect 4k honor and then spend it immediately on hitting 100. 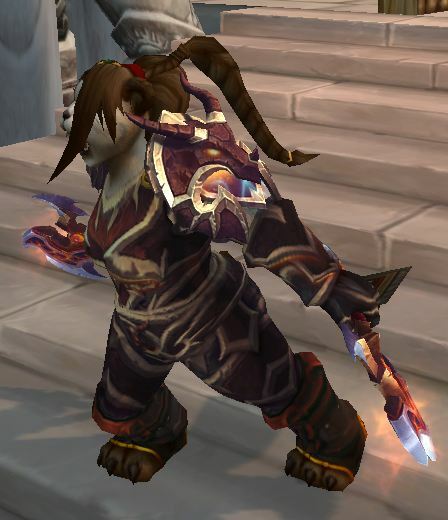 By level 70, if you’ve accumulated about 2k honor, you can pick up the Brutal Gladiator gear set from the legacy arena vendors. There are similar sets at 80 and 85, though they cost a lot more honor. If you are going to stay at level 90 for the PvP, then get the Crafted Malevolent Gladiator set and upgrade to Pridefull Gladiator as soon as you can. There is no crafted PvP gear in Draenor. but at 91 you can equip a max three crafted items from your Draenor Blacksmithing. Figure on the ilevel 630 weapon and two pieces of 640 armor. I suggest chest and legs for the higher stats, compared to other pieces. These pieces will all have random secondary stats. All these pieces can be upgraded by 25 points, at a cost greatly exceeding that of the original item. Stats can also be rerolled as many times as necessary, which is, fortunately, not expensive. Weapon: Steelforged Greataxe, reroll with Truesteel grinder, upgrade with Steelforged Essence and Greater Steelforged Essence. chest and legs: Truesteel Breastplate and Truesteel Grieves: reroll stats with Truesteel Reshaper, upgrade with Truesteel Essence and then Greater Truesteel Essence. Get a Crafted Malevolent Gladiator’s Medallion of Tenacity, if you don’t already have something similar. Human Warriors, of course, don’t need one. Draenic Philosopher’s Stone, requires Alchemy 500. This item is upgradable since 6.1. PvP gear in WoD has two ratings, one for PvE, the other for PvP. For example, the Honor gear is 670/710. The second number applies to any PvP that you do (this first is for PvE) and is higher than any PvE gear that you’re likely to get. Most PvE gear is uprated in instanced PvP to 690, but the PvP gear starts at 700 and so is clearly better. Higher level PvE gear is downrated to 715. Conquest gear goes to 730. By the way – if you DO get raid gear that’s higher level than the honor gear’s PvP rating, then keep it. There are actually three tiers of PvP gear in Warlords Season 2. Wild Aspirant is ilevel 625/700 and is found in strongboxes won from the BGs or Ashran PvP events. It can also be found as “Warforged,” which adds 6 item levels. This gear can only be found in the strongboxes. Wild Combatant is the honor gear. It’s 675/710 and can also be Warforged. This gear can be bought, awarded from your Gladiator’s Sanctum work orders, or found in strongboxes. Wild Gladiator is the Conquest gear and is 700/730. It cannot be Warforged. In Warlords there are more ways to gather gear and points than ever before. You can also, with just a bit of luck, get free gear through the strong boxes that drop in BGs, from Ashran events, and from your Gladiator’s Sanctum. Ashran events award honor, conquest, occasional boxes, and misc items. These events are PvE and involve killing the various level 102 bosses in the zone. Killing players results in your receiving bones. You hand the bones into your Gladiator sanctum, to be processed as Work Orders, and can get Honor and Conquest points, Apexis Crystals, gear pieces, and a very other misc. items. Bones can also be found in World PvP (ie: ganking.) Getting them in Ashran is far faster. Killing players and any NPCs, in Ashran, also rewards Artifact Fragments which you hand in at your base for Honor and faction rep. If you die in Ashran you will lose half your artifact fragments. Then there are the tried and true means of gaining points, the Battlegrounds and the rated PvP (Rated BGs and Arenas.) BGs award Honor and some conquest points, if you win. Rated PvP only awards Conquest. If you win. Every gear slot has two options for the honor gear and three, with sufficient faction rep, for the Conquest gear. Only one of those options come with a set bonus, the others do not. Our suggestion is to go for the pieces with the set bonuses. There is a 10% Damage Reduction (Vs Players) bonus for the PvP trinket pair. Primal Gladiator’s Plate Chestpiece has the set bonus, which you want. This piece has Crit & Mastery. Primal Gladiator’s Plate Chestpiece has no set bonus and comes with Crit and Versatility. 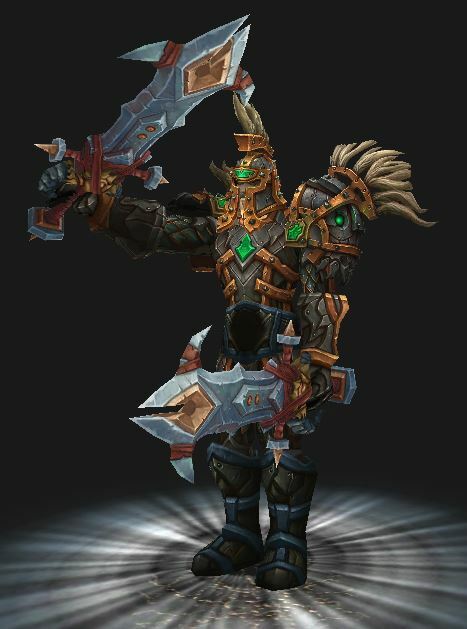 Primal Gladiator’s Plate Chestguard, has no set bonus, requires the faction rep, and has Versatility and Mastery. Yes, those pieces do have the same name, so make sure you double check that stats when buying. Honor weapons have no special requirement for purchase, Conquest weapons require 7,250 points earned in the season. The crit soft cap is 30% and getting all Crit gear might push you over that, especially with buffs. If your Crit is getting too high then swap out Crit enchants for Mastery enchants and maybe Crit gear for non-crit gear, looking for pieces with Mastery. The two piece trinket set offers 15% damage reduction Vs players, so consider getting them as your first purchases. Trinket 1: “On Use” Str proc. Humans can also get the Str proc. Things that will help: learn to keybind. There are a number of good videos for that on YouTube. You can also grab a piece of software that will do it for you. It’s here. Communicate with your team. If you’re serious about PvP (or raiding) then you’ll get a headset, a mic, and hook up to their (or they connect to your) Ventrilo or Teamspeak or similar client. AKA: Fury PvP Rotations, Cooldowns, Priorities, etc. Weapons – two 2-handers are better than two 1-handers, due to increased stats and a little more Rage production (more rage per strike.) Plus, a pair of 2-handers also just looks better. 😉 They’re quite close, though. Figure that your first CC, such as you Fear, will be trinketed. So one useful strategy is to force him to blow his trinket early. It’s cooldown is far longer than your CC abilities. Or Teamwork. You Fear, he trinkets, your Mage buddy Sheeps him. Charge root – useful for peeling, such as when your healer is being pressured. Hamstring slows one enemy, which makes kiting/chasing that much easier. Intimidating shout – this is your “Fear,” scaring away up to 6 opponents. Great for peeling or disrupting coordinated attacks. Anywhere that a Fear might be useful. Pummel – locks out a school of magic for four seconds. Be aware of the possibility of fake casts, you want to avoid pummeling those. How do you know? Practice. Example: Frost Mage Deep Freezes your healer, he has four seconds to get a polymorph off before the Deep ends. If a fake is going to happen then it’ll happen at the beginning of that 4 seconds, the real one will be near the end, when he has to get it off. Recklessness is a 3 min cooldown that adds 30% to your crit chance (with your perk) and last 10 seconds. Fury damage is very proc based, especially if you play with Sudden Death. Bloodthirst builds Rage and the crits Enrage you (+10 Rage and 10% more damage,) therefore you want to keep using it even though it doesn’t hit very hard. Ideally you will be able to spend the entire fight enraged. Also has a chance to generate two Wild Strike charges, that are Rage free. Depending on how the procs are coming you may be able to skip a Bloodthirst. Wild Strike hits harder and reduces enemy healing. If you took Furious Strikes then it’s almost spammable. Raging Blow hits still harder, but you only have access to it when you become enraged. Each “enragement” adds one charge, max of two. Execute hits hardest of all and is normally usable only on low health opponents (20% or less,) but the procs from Sudden Death have no such restriction. Bladestorm, of course, generates no procs, but still has it’s uses. Burst then amounts to generating a bunch of procs and using them. Line up a Sudden Death proc, two Raging Blow procs, and two Wild Strike procs, any trinket procs, and Recklessness and you’ll do some damage. Use the procs before their timers run out, as procs that expire do no damage. You can find many more Fury Warrior PvP videos and info on Skill-Capped. Just a guy cleaning up the Temple of Kotmogu as Fury. Not a guide, just hacking and slaying, and he really seems to be enjoying himself. As you know, any race can be a Warrior, including the Pandarens. If you want to make a new Fury Warrior for use in PVP, or just a race change, there are some things to consider. The following lists some specific racial abilities that will be helpful, but your skill and gear will count for more than any racial abilities. If you want to blast your new Warrior (or any alt.) to 100 ASAP then look into a step by step leveling guide. Horde: Blood Elf & Orc. Being Bouncy results in less falling damage, which has some situational, but nice, PvP use. Being a food lover results in your receiving greater benefits from food buffs. You can stun an melee-range opponent for 4 seconds. A rather weak stun that’s easily broken, but it’s a decent interrupt. Rest XP lasts twice as long as normal. Nice for faster leveling, but obviously not much use in PvP. You can choose either Horde or Alliance once you leave the starting area. Gnome: Size and Escape Artist are the reasons that some say the Gnome is the best of the Alliance PvP races. Escape Artist : Escape the effects of any movement speed reduction effect. +1% crit is a general DPS increase and is always welcome, especially for Fury. The other racials are to snooze over, as far as PvP or Fury is concerned. Shadowmeld : Activate to slip into the shadows, reducing the chance for enemies to detect your presence. Lasts until cancelled or upon moving. Very situational in the Arena, but has its uses elsewhere when a rest is necessary or you’re able to set up an ambush from the shadows. Can also be used to interrupt spells if your timing is just right. Melding as the spell is on its way breaks the spell. Quickness : Reduces the chance that melee and ranged attackers will hit you by 2%. This is more useful for tanking than PvP, but every little bit of defense helps. +1% Crit by day only, +1% Haste by night. Blood Fury Increases attack power for 15 sec. Very nice, even outside of PvP. Lines up well with “on use” trinkets. Hardiness “Duration of Stun effects reduced by an additional 10%.” Reducing stuns is always a good thing. Arcane Torrent is a very useful area blanket silence and restores some Rage. Berserking Increases your Haste by 15% for a few seconds, which is just Ok. Add it to the appropriate macros. War Stomp: “Stuns up to 5 enemies within 8 yds for 2 sec.” This is a very useful interrupt. Shares Diminishing Returns with any other stuns that you have. Endurance “Base Health increased by 5%” – More health is always good. Good with Herbalism – adds a nice heal and a Haste effect. Will of the Forsaken removes any Charm, Fear, or Sleep effect. This is the one useful PvP ability for the Undead, but it’s a nice one. Redundant with your Berserker Rage. Touch of the Grave drains life and heals you for the same amount. Cannibalism regenerate health and is a nice slap in the face to a defeated opponent. Indefinite underwater breathing might have some use, somewhere. 1% Increased Haste is not very interesting. All of the profession bonuses are dead in Warlords. Now you use them to make gold or to craft certain items (eg; Rockets.) See our gold pages if you need help with the cash flow. Dreanor professions are much easier to level than before and your garrison buildings will be quite useful if you decide to do that. You can even make some items using your garrison without actually having the profession. First Aid lets you create a pretty nice healing potion. Keep a few on your bar. Engineering will let you create some pretty useful items (rockets, shields, a stealth device, etc.) and Blacksmihing will let you create some nice beginning raid gear, which will do for PvP until you can replace it. Note that Pandarens get twice the food buff. All food buffs last one hour and provide only one stat. The buffs goes away when you die. The various foods/chemicals are not usable in rated PvP, though they’re fine everywhere else. You can use Flasks or Elixirs and the Flasks are much more interesting. Stout Augment Rune: +50 Str for one hour. Occasionally drops from WoD bosses (in Raid Finder mode) and is also sometimes found as mission rewards from your Garrison. Stacks with flasks and other buffs. Ok, you’re not yet high enough level to raid or do the Arenas. Maybe you’re even level 1. Have a plan to hit the level cap ASAP and get into that yummy end-game content? Or will you just aimlesslay wander about the world, trying to decide where to go next? To make your job a lot easier you should consider an expert leveling guide for your 1-100 blast. With the guide you will never again wonder about where to go or what to do and your leveling will be faster, much faster. 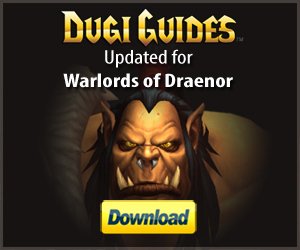 Dugi’s nearly automates the whole leveling path, from start to finish, for your Warrior (or any other class. ) Carve your way through the world and the content at a surprisingly crisp pace. Pick your starting point and the guide automatically updates and advances as you complete quests, sets a waypoint arrow automatically, and includes the important quest info. Take a break to do some PvP leveling, instances, or whatever and when you come back to the guide it will figure out what level you are and pick up from there. Automatically. 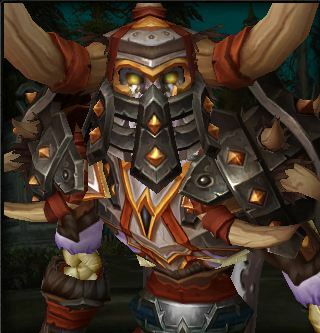 It doesn’t matter if you’re brand new to WoW or you’re decked out in Heirlooms and using Recruit a Friend, Dugi will get you to the level cap faster. Click here now to grab your own copy and get to 100 fast. And then kill the other guys.